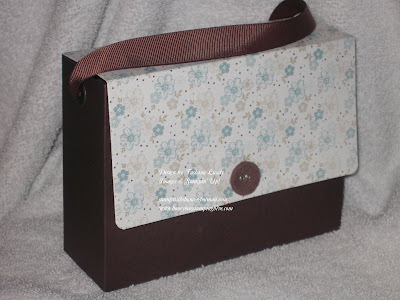 I decided to make a Purse to hold the 3x3 note cards I shared yesterday. The purse can hold full size cards, however, I am putting other things in mine. I found these cute little tins of gum/mints at Cracker Barrel. I made a little box to store it in. That will also go in the purse. 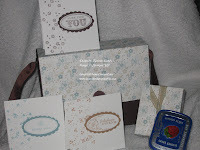 I found the tutorial for this Simply Scrappin' Kit Card Box here. I used Chocolate Chip card stock, 5/8" ribbon, and Corduroy button on this project. The DSP is from the Parisian Breeze Specialty paper. I also used 2 Jumbo eyelets on the side for my ribbon to go through for the handle.